Kemping La Croix du Vieux Pont Berny-Rivière, Aisne ban található, fekvése Folyó vagy patak partján fekszik (legfeljebb 0,1 km) és (Üdülő)tónál fekszik (legfeljebb 0,1 km). A kemping táborhelyekkel rendelkezik Parcelázott helyek, Árnyékos helyek és Árnyékos helyek előfordulnak. Camping La Croix du Vieux Pont közelében található Homokos part. Garzon és Apartman bérelhetők. A kempingben Gyerekjátszótér, Fedett játéktér és Sportpálya. A sportolást kedvelő nyaralók részére a kemping kínálata: Szervezett kiránduló program főszezonban legalább hetente kétszer és A kempingbol induló kerékpárutak. Animációs program és Fitness-helyiség. Azok számára, akik egy mozgalmas nap után kikapcsolódni vágynak Szauna, Napozópad, whirlpool, Termálfürdo és Szépségszalon. A kempingben Élményfürdö, Kültéri medence, Belso uszoda tolótetovel és Gyerekmedence (1- től 3 éves korig, < 40 cm). Er is ook een Vizicsúszda (>10 m) aanwezig. A közelben található úszási lehetőségek: Fürdési lehetőség tóban. Ez az ellenőr minden évben felkeresi a(z) Kemping La Croix du Vieux Pont kempinget és több mint 200 szolgáltatás és ellátás szempontjából ellenőrzi. Az ellenőr az ACSI munkatársa, és nem áll a kemping alkalmazásában. Stopped off on the way down through France, this will be our third visit. This time got placed for the night in the bottom area where previously a static had been. Pitch was good. Walked into the nearby village on a Saturday night - no one around. Please do support the local bars. Didn't eat on site as menu was poor and over priced. Visited on 13 February 2017 and found that the only placed to stay overnight in our motorhome was on hardstanding next to reception. Very expensive for no catering facilities, no WiFi, poor quality cold showers/toilet, electricity on long lead to grass campsite point, NO chemical toilet disposal. This level of facility should not be charged at the summer rate when no doubt the site is fully operational. Alternatively, the site should stay closed in the winter and admit that they cannot provide the range of services. Disappointing and will not stay here again in the winter. Unfortunate that our short visit coincided with heavy rain, but my verdict would have been the same even in good weather. The staff were friendly and helpful, but the site is not suitable as a night halt. It is more difficult to get to than I expected; we were pitched on an open, unmarked area with limited hookup facilities; waste and chemical points were some distance, and unmarked; toilets had no paper and the showers were cold. And this is a five star site at the highest ACSI price? TO be avoided as a night halt. The main complaint was the inadequate electric supply, which was 6 amp (although the ACSI Directory has 16 amp printed - a very serious error!). Two of the caravans initially had to share the supply, meaning that each had 3 amps only - totally inadequate. A complaint was made about this, and the initial response was that an electrician would be available on the Monday - this was on a Saturday. A strong protest was made about this, and a man was sent to the pitches to deal with it. The solution was for one caravan to be hooked up, with a very long cable, to a pitch some distance away. Because of these problems, there was a unanimous decision to stay for only one night. 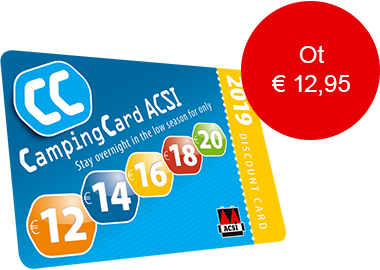 Reception was told that we considered the ACSI charge of 19 Euros per night was far too high, to which the response was that the charge was cheap! We moved on the next day to another site, which was far superior to La Croix. We consider that the site at La Croix should not be entered in the ACSI Directory for caravanners. The site is obviously popular but it is geared more for chalet users with children. Hopefully ACSI will take note of these comments. This is a very large ‘holiday village’, not the normal ACSI site. It has plenty of activities, swimming pools, shops etc. It has pre- erected tents, wooden chalets, and mobile homes which seem to cater mainly for the Brits. Touring caravans/tents seem to be a side line. The electric is only 6amp not 16 as stated in the book and we had to share at one point which gave us 3amps. Our pitch alongside the river was water logged due to the heavy rain fall and dangerous underfoot. The toilet facilities we used for our 1 night stay were clean. Wifi was available at a charge in a restricted area. If you are looking for peace and tranquillity this is not the site for you!! Lefoglalja a(z) Kemping La Croix du Vieux Pont kempinget, vagy bővebb információt szeretne? Ezt az alábbi módon. Az ACSI Eurocampings továbbítja az Ön információkérését a "Kemping La Croix du Vieux Pont".